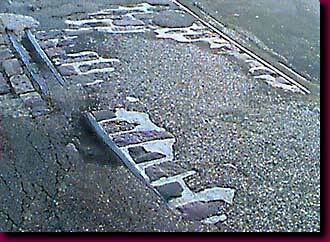 Remains of Detroit's once extensive interurban street rail system occasionally appear through decaying streets. They are a reminder of the brick street days of the first half of the 20th Century when a celebrated mass transit system moved Detroiters throughout the rapidly growing city. The destruction of a mass transit system of interlinked street railway cars was effected in the 1950's when the remaining cars were sold to Mexico City. Why did the city need them when nearly everybody could drive cars to their increasingly rural homes? The consequent dispersal of the population of Detroit in the years following World War II triggered a chain of downward spiraling dominoes. Less people of less means remained. Less taxes collected resulted in less services and a diminished quality of life and security. Neighborhood libraries closed. Fire stations and schools were consolidated, then closed. Small businesses failed and none took their place. Roads and walkways fell into disrepair. More people moved away and a new line of dominoes begin to tumble. Why Do You Think Happened?